Albuquerque--New Mexicans may not realize what a major role our state has played in the understanding and exploration of space. But, the exhibit, “Space Frontiers,” which opened in 2009 at the New Mexico Museum of Natural History and Science features a variety of artifacts on long-term loan from the New Mexico Museum of Space History and explores the astronomical discoveries and technological innovations that have guided humanity into space. A fossil tooth of a 73-million-year-old Albertasaurus collected near Farmington, NM, taken aboard the Space Shuttle Atlantis in 1988 by New Mexico astronaut, Colonel Richard M. (Mike) Mullane (USAF, Ret.). A cut cube of New Mexico turquoise taken on board the Space Shuttle Atlantis in 1990 by New Mexico astronaut, Colonel Richard M. (Mike) Mullane ( USAF, Ret.). A peice of Sandia Mountain granite, collected from the Sandia Mountains east of Albuquerque, taken on board the Space Shuttle Atlantis in 2000 by New Mexico astronaut, Susan J. Helms (Brigadier General, USAF) NASA Astronaut (former). “Space Frontiers” is a collaborative exhibition developed by The New Mexico Museum of Natural History and Science and the New Mexico Museum of Space History. 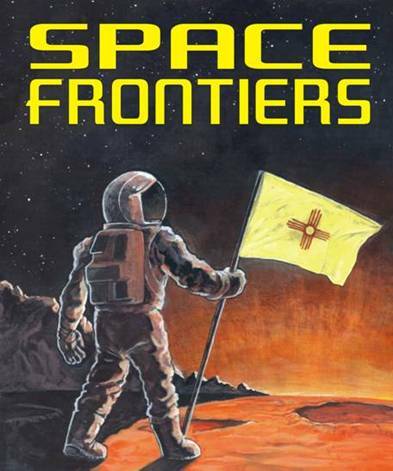 “Space Frontiers” features the rich heritage and exciting future of space exploration in New Mexico. Located at the top of Hwy 2001, the "Golden Cube" of the New Mexico Museum of Space History can be seen from almost every point in Alamogordo. Founded in 1976 as the International Space Hall of Fame, the museum is a premier tourist destination, hosting over 100,000 visitors each year. The mission of the museum is to educate the people of New Mexico and its visitors from around the world about the history, science and technology of space exploration. The New Mexico Museum of Space History is a division of the New Mexico Department of Cultural Affairs. The Department of Cultural Affairs preserves, fosters and interprets New Mexico’s diverse cultural, scientific and artistic heritage and expression for present and future generations, enhancing the quality of life and economic well-being of the state.